TrackVia allows you to plot pinpoints on a map using Latitude and Longitude coordinates. These data points can be imported or added and edited through a form to display the pinpoints on a map. 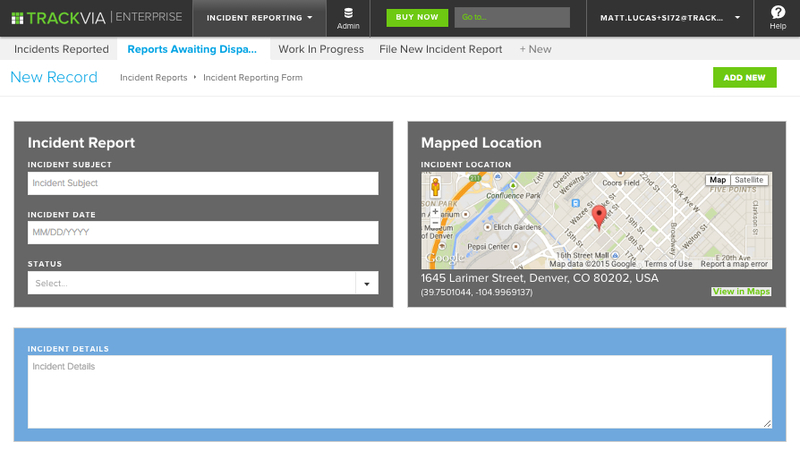 You can also add or update the address of a location field by utilizing a TrackVia form. Location fields even have a 'Location at Creation' setting to capture the coordinates of a location where the records were created and not allow for it to be edited. In order to enter coordinates or capture the location of a record, you must first add the Location field to your table. To import: First, make sure you have a location field in your table. When you import into your table, simply pass in a Latitude and Longitude, comma separated (e.g. 40.785091,-73.968285) and select your location field to import into. We support 'signed degrees format (DDD.dddd)’ which pinpoints location within 1 millimeter. Editing on web or mobile: Your location field will automatically show as a map with a pinpoint on a form, and immediately below you’ll see your Address, Latitude and Longitude. As long as the Location at Creation setting is not enabled, you can edit any of the three options. The Lat and Long will update when you edit the Address, and vice versa. When the Location at Creation option is enabled, each time a record is added, the Latitude and Longitude will automatically capture your current location's coordinates if the device used has access to that information. The location field will not be editable, ensuring data integrity for where a user is entering information. There is also a setting available called Required for Mobile Apps. Since this Location at Creation setting is mainly utilized for people out in the field using our iOS and Android apps, you have the ability to require it on those mobile apps. Mobile app users will need to have location services enabled to create records if the field is Mobile Required. 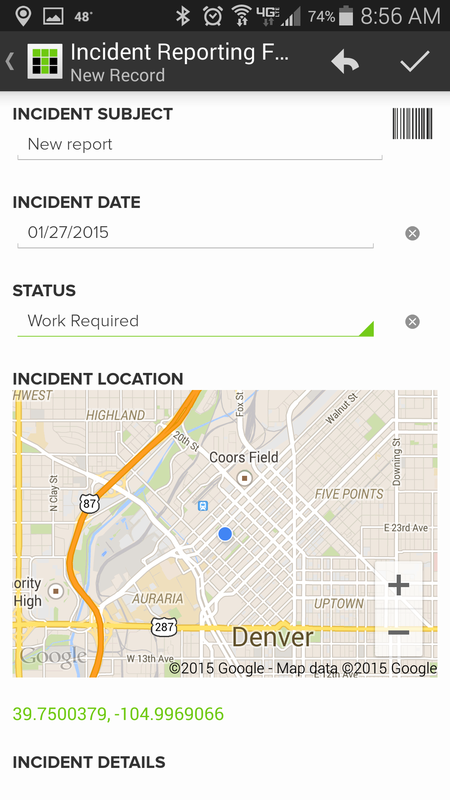 When a Location field is added to a form, you can view the pinpointed location on a map. When opening a new record form on a computer, you can see that the map will center and drop a pin at your current location regardless of the Location at Creation setting being enabled or not. Adding a record on one of the mobile apps will have the same effect and use the accuracy of your device’s built in GPS. When you come back to this record in the future you will be able to see that same captured location. When you have a record in a view that contains a captured location, you can click the "View on Map" link to display your point on a map. 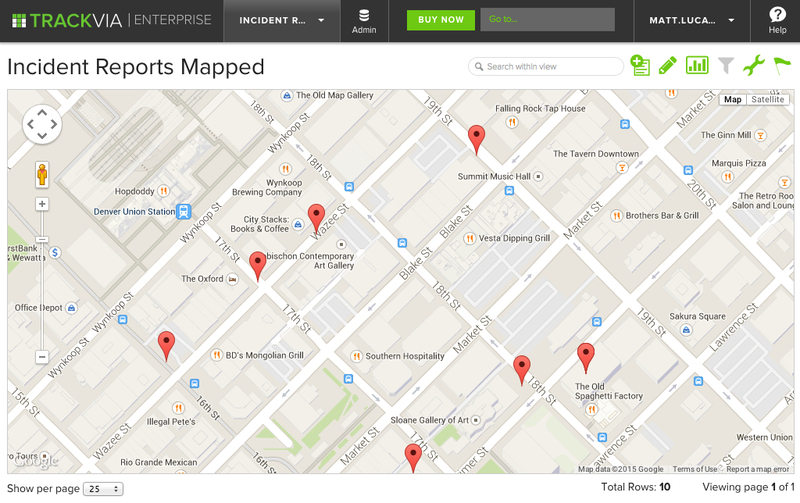 You can also flip a grid view into a map view (available with Enterprise package and above). Click the menu in the top right corner of any view that contains the Location field and click Maps to display multiple pinpoints on a map. 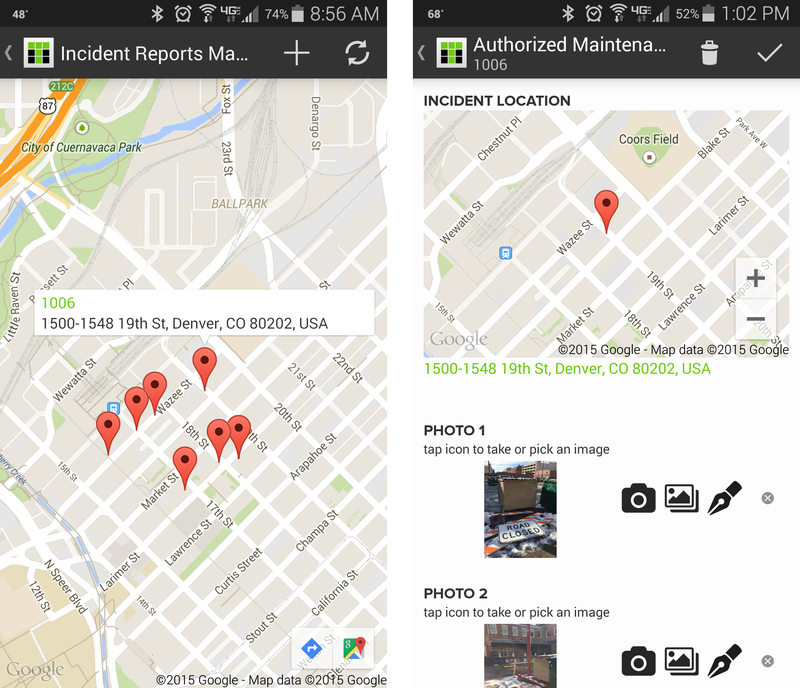 These maps can be used on dashboards and works great with mobile features like one tap directions, click to call, and an integrated camera. Note: All ‘Location at Creation’ pinpoints are red, all other Location fields are blue. In this example, the first two inputs to the distance() function are Location fields (latitude and longitude) in the table. The last input can be "mi" for miles or "km" for kilometers. 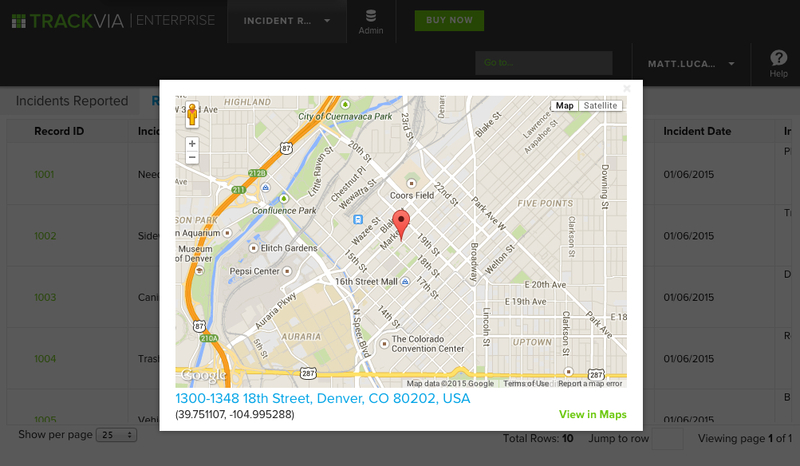 TrackVia Mobile Maps: Capture Field Location Automatically!